As much as we all love naan with our curries, naan is made from refined flour (plain flour, all purpose flour) which is not that healthy. During the process of refining the flour, the husk and bran, the most nutritious part of the wheat grain and rich in fiber is removed. What is left the white part which is carbohydrate, without any vitamins or minerals. Bleaching chemicals are used to make the flour more white. Consuming white flour on a regular basis along with sugar is bad for the body. Weight gain, insulin resistance and diabetes may result in over consumption of white flour. In order to enjoy naan but in a more healthy way, I make it using multi grain flour. I make my own mixture at home as we don’t get it in the shops here. I use about 8 different grains to make my multi grained flour. I use this flour daily for rotis and parathas. The recipe for the multi grain is given below. When Karen of Karen’s Kitchen Stories set the theme of using garlic in our bake for the month of April, I kept on thinking about garlic bread. I’ve already baked breads using garlic. So had to clear my head and think of other options. Made egg curry a few days ago and multi grain naan. That’s when the tube light went on and I decided on my bake for April. Naan with garlic are just awesome, tasty and add a whole new dimension to the boring plain naan. 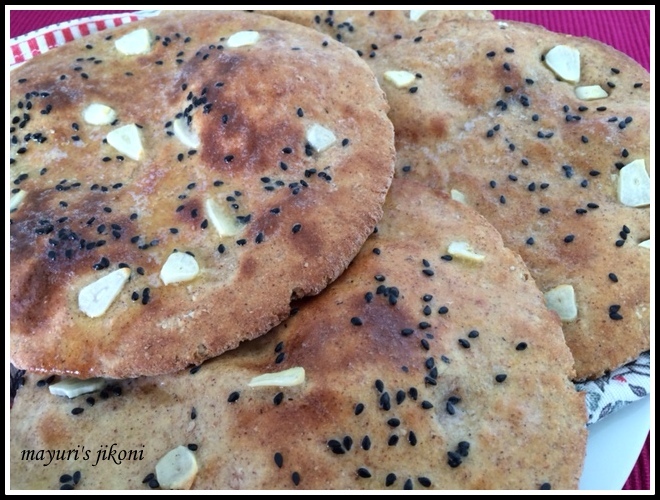 So without much rambling, here’s the recipe for multi grain garlic naan. Mix all the flours very well in a large container. Store in an airtight container. I prefer to sieve the mixed flour for an even mix. Mix flour, yeast, salt, soda bicarbonate and sugar in a mixing bowl. Mix milk and yogurt together. Using the milk yogurt mixture form a dough. Put the dough in a greased bowl. Cover and let the dough rise till its double the size. This takes about 1-1½ hours. Knead the dough gently. Divide it into 10 -12 parts. Roll the dough parts into balls. Cover with a damp cloth and let the dough rest for 15-20 minutes. Dust the worktop with a bit of flour. Take one ball and roll it out into a round or oval shape about ¼” thick. Scatter the garlic slices and black sesame seeds (or nigella seeds) over it and gently roll over it once twice, lightly. Roll out the remaining dough and place on baking trays. Brush the top of naans with water. Place the rolled naan in the hot oven and bake for 5-6 minutes. Half way through, flip the naans over. Remove the naans from the oven. Bake the remaining naans. Just before serving, switch on the broiler (grill). Let the naans bake for 2-3 minutes till its light brown on top. Brush with butter and serve immediately. Roll out all the naans before baking. Its easier to keep an eye on the baking and broiling. You can add fresh fenugreek leaves to the dough. Top the naans with chopped chillis instead of garlic or add both. Gluten Free and Vegan Garlic Breadsticks from What Smells So Good? After I'm done eating all of my white flour naan, I'll have to give yours a try, lol!!! Nice combination of grains!! I love the multi-grain touch! Great idea making a multi grain Naan. I can't wait to try it. You've made a healthy naan that looks great and must have tasted so good too! Wow, your multi grain flour sounds amazing Mayuri and the garlic naans look delicious. Oh my Mayuri not only does your garlic naan look fabulous it is also super healthy. I love it! I must give it a try once I round up all the different kinds of flour. Not sure if I would get all of it here. Multigrain garlic naan looks delicious love it. These naan bread's look so yummy, especially with those big pieces of garlic. Thanks Amrita, and it tastes great. Thanks Smruti, I use the mixture of flour for my daily rotis and parathas too. Thanks Karen, loved the theme. Do let me know how it turns out Wendy whenever you try it out. It does taste great Holly. Try it Pavani, though it doesn't taste like the plain flour ones, its a wonderful healthy option. Thanks Georgina. You could perhaps try it out with the ready made multigrain flour that other bakers use for breads. I mix mine as we don't get ready made multigrain flour in Mombasa. An healthy and soft multi grain naan. These naans look so very healthy and delicious. I love your multigrain flour mix, it must be great for parathas too. Is it soft? Would love to try this some time.